Help us spread the word by adding one of our banners or link to your website. Simply copy/paste the code into your website. Highlight the banner code you want simply by clicking on the text area field. Copy the contents to your clipboard. Press "Ctrl C" (windows users) or Right Click your mouse and select copy. Paste the code into the webpage you want the banner to appear. Press "Ctrl V" (windows users) or Right Click your mouse and click Paste. 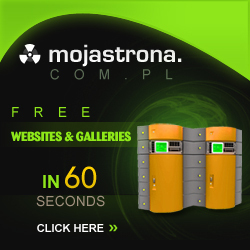 Mojastrona.com.pl - In 60 seconds and TOTALLY FREE you can create your own professional website or photo gallery.